The Wall is as lean and economical as a war movie can be. There is one location, no musical score and three speaking parts, only two of which come from actors that appear onscreen. The film is 81 minutes, and it feels like it — a refreshing break from the increasing bloat of studio actioners. Set in a tumbleweedy, post-“Mission Accomplished” Iraqi oilfield in 2007, The Wall follows a pair of U.S. soldiers — forgotten men in a by-then-forgotten war — crouched in camouflage, their weapons aimed at the site of a recent surprise attack that killed a handful of contractors. 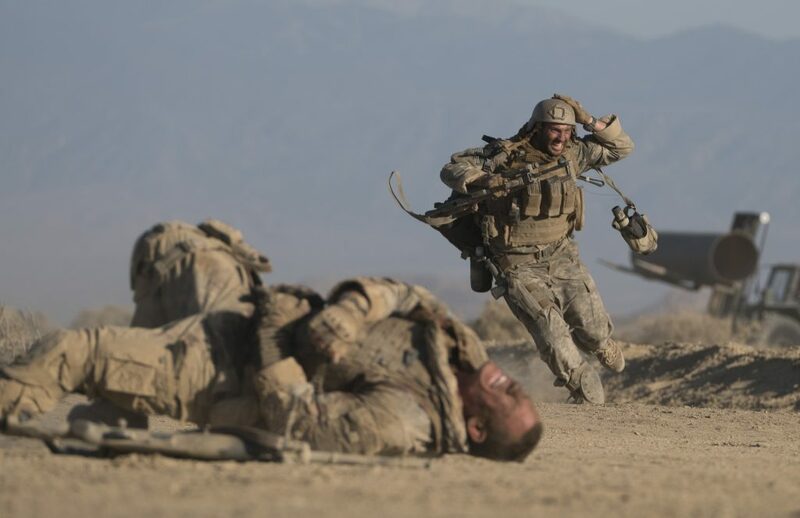 The bodies of their fellow Americans remain slumped against their equipment, but for Army sniper Allen Isaac (Aaron Taylor-Johnson) and his spotter, Staff Sgt. Matthews (John Cena), the possibility of action seems as remote the Antarctic tundra. They’ve been idling on their military stakeout for 20 hours with nothing and no one in sight. Surely they can determine, by now, that the coast is clear? No sooner does Matthews stretch his legs to retrieve his comrades’ radios does the expected carnage begin, arriving in the form of a few strategically aimed bullets from a phantom sniper. Within minutes, both men are hit — Matthews perhaps fatally. Isaac escapes, with a wounded knee, behind a crumbling wall about 8 feet in height, a meager but life-saving fortification. The Wall is a matter-of-fact survival story, its plausible particulars polished by technical advisement of a real-life U.S. sniper, its violence graphic, unflinching and ultimately brief. Director Doug Liman, from a script by Dwain Worrell, prefers the sustained suspense of psychological warfare to the transient sensorial jolts of the traditional kind. This is largely a film of faces, grunts and words, not bullets and bombs. Special kudos are due to cinematographer Roman Vasyanov and makeup artist Jamie Kelman, for capturing brutally honest portraits of these traumatized soldiers in the unbearable Iraqi hinterlands. Shot often in close-up, Taylor-Johnson’s visage is an abstract painting of snot and congealed dirt battered by the bitter desert wind, a brackish mixture of bodily fluids and environmental detritus. His character, communicating through a dead contractor’s staticky radio, tries to call for help, only to find that his unseen nemesis — an Iraqi super-sniper known as Juba — has intercepted the airwaves. Juba (Laith Nakli) wants to talk, to “get to know” the soldier he’s just crippled. After much resistance, Isaac begins to placate his opponent, all while scoping for his whereabouts from his limited purview behind the wall — a fruitless visual continuum of oil derricks, construction equipment, and a mound of garbage. Though there’s nothing supernatural in its narrative, The Wall feels a bit like a war zone meeting The Twilight Zone. In its attempts to understand the point of view of the Other, it shares the pointed empathy of Rod Serling’s more earnest teleplays, sometimes to the point of overkill: Juba actually utters the shopworn overture “We’re not so different, you and I.” Juba posits himself as a regular Iraqi citizen who’s had enough, an avenging angel settling the score for so much U.S.-caused “collateral damage.” The wall providing Isaac his temporary safety is, Juba says, the last remnant of an obliterated school. Of course, by keeping Juba in the shadows, Liman and Worrell miss the opportunity to truly neutralize his Otherness. The filmmakers take a blinkered view of their villain, maintaining an American centrism throughout the story, and treating what could have been a cerebral tête-à-tête between opposing factions as a cynical cat-and-mouse game engineered by a savvy psychopath. Juba’s schemes grow more baroque and his lethality more far-fetched as the story reaches its unsatisfying end, leaving any attempt to understand the motivations of the “enemy” to the very garbage heap that might be providing his shelter. The Wall remains a worthy, big-screen experience thanks to a grueling performance from Taylor-Johnson, a character actor of fine dexterity, and to Liman’s command of the space. For 80 minutes, we’re stuck in the same arid hellhole with a guy that can’t stand on two feet, but we never weary of it.